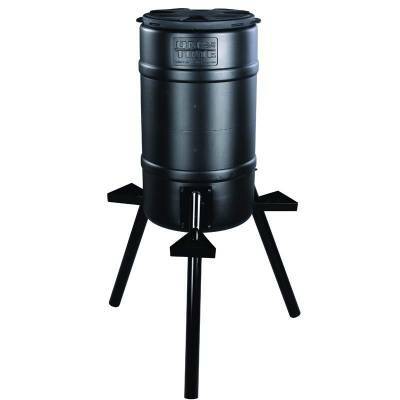 On-Time Buckeye 30 Gallon Gravity Deer Feeder. An innovative approach to deer feeders, the Buckeye is designed to let gravity fill the feed tray ensuring that fresh feed is always in stock. Each of the three 2" diameter legs holds a separate feeding station with drain holes for consistent flow. With no moving parts to break down or a battery to run out of power the Buckeye can be used year-round without worry! Its 200-lb. hopper features an internal feeder funnel and a removable lid for convenient refill. Accepts all types of deer feed. Easy to install on a variety of surfaces. Some assembly required. Height: 5 feet tall.